We are an award winning team of solicitors who specialise in industrial disease claims. We use our many years of experience and knowledge in this area to file claims with employers’ insurers. Using our specialist knowledge of health and safety and negligence law, we prove and value our clients’ injuries and successfully negotiate maximum settlements with insurers. Where we are able to prove an injury, we are successful in most claims. Only solicitors can pursue your claim. Unless you are dealing directly with solicitors, then you are going to be talking to a middleman, such as a Claims Management Company, who will then pass the claim on to a group of solicitors and charge you a fee for doing so. What does No Win No Fee actually mean? It’s simple: If you don’t succeed in your claim, you pay nothing. Each year hundreds of thousands of people suffer from accidents at work. Many people choose not to make any kind of accident compensation claim in the fear that it could be too expensive. 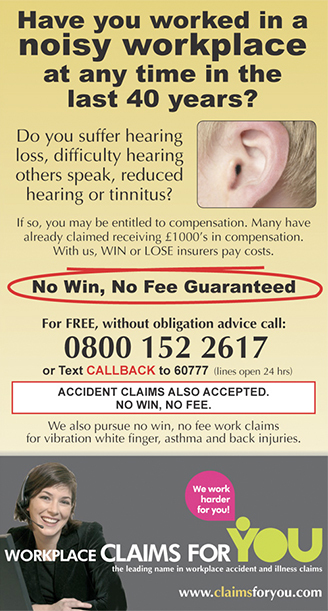 Claims for you offer a NO WIN NO FEE service so you will be able to pursue your injury claim without the fear of running up expenses. We pride ourselves on providing justice for people who have suffered from injury. Our advisers and solicitors will be able to give you some guidelines as to what you might expect to receive if you win your claim. Since our firm was established 13 years ago, we prided ourselves on our clients receiving 100% of their compensation. As solicitors, we claim our legal fees from our opponents on top of any compensation and therefore, we gave the guarantee that our clients receive 100% compensation. However, following Government changes and the introduction of the Legal aid, Sentencing and Punishment of Offenders Act which came into force on the 1 April 2013, we are now not able to recover all of our legal fees from our opponent and therefore only on successful cases, we do make a small charge from our client’s compensation. Therefore, if you are successful in your claim there will be a charge of up to 20% of your compensation. If for whatever reason, you are unsuccessful we will make no charge for our work and therefore our agreement remains a no win, no fee agreement. Given the new rules will allow solicitors and claims management companies to charge a fee of up to 50% of the compensation awarded (and we are aware of firms who do this), we think our small deduction is very competitive and keeping in the tradition of ensuring clients get the maximum, and as much of the compensation as possible. Will I have to fill out loads of paperwork? Your accident solicitor should be able to do most of the necessary paperwork for you. You will have to check the details of your compensation claim before it is put forward, but your solicitor can help you with this. That’s not a problem, just call or email and we will advise you if you have a claim and the time limits that apply. You don’t have to proceed but we do hope that if you do decide to proceed later, you will think about using our services. We believe we offer an unrivalled service and have righted many wrongs for our clients. We have countless recommendations, commendations and “thank you’s” from our clients.